There are few luxury vehicles available today that inspire awe and admiration quite like the world-renowned Rolls-Royce. Even the most classic of Rolls vehicles are held in a higher regard than many brand new regular consumer automobiles. For over 110 years now, the Rolls-Royce brand has been manufacturing some of the highest quality, most luxurious vehicles money can buy. One of the more popular choices of Rolls vehicles is the Rolls-Royce Ghost. A staple model of the European luxury brand, the two-door Wraith and the convertible Dawn were designed like the four-door luxury Ghost sedan. If you’re in the market for a new or preowned Rolls Ghost or one of its similar models, you know that you have a lot of things to consider before making your purchase decision. The Ghost was designed as a luxury vehicle with more practical uses than other Rolls-Royce models, with the intent of appearing more sporty. The Ghost is noticeably smaller than its the Phantom, the former being more than a foot shorter than the latter. The front of the Ghost sits up high, while proudly displaying the RR emblem, known as the Spirit of Ecstasy, for everyone to see. The angel at the front of the vehicle can be retracted at the push of a button if you so desire. On the standard Ghost model, the angel on the front hood comes in stainless steel, but you can opt for a more expensive crystal or 24 karats gold if you choose to do so. 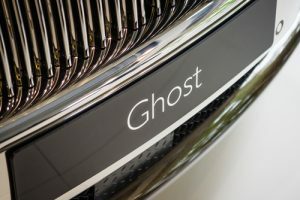 The grill of the Ghosts adds to the more sleek, sporty and stylish design approach to the Ghost, compared to the front ends of older Rolls vehicles. The Ghost features bright LED daytime running headlights that allow for high visibility in just about any weather conditions. Even though the Ghost is considered the smaller, sportier Rolls-Royce model, it is still significantly larger than most cars, measuring almost a full 18 feet. The two front doors on the Ghost open and close like any other vehicle, but the rear suicide doors open in such a way that gives a full view of the luxurious interior of the backseat. The thought process behind this stunning design is that many Rolls-Royce owners tend to sit in the back seat as passengers, instead of being in the front driving the vehicle. The two-door Wraith and convertible Dawn both also feature suicide doors as well but were moved from the back to the front. You can even make the purchasing decision to have the rear doors open and close automatically, adding yet another layer of impeccable Rolls-Royce style and class that is unmatched. If you do plan on being the primary driver of your Rolls-Royce Ghost, you will not be disappointed. Along with unparalleled luxury, the handling and overall driving experience of a Rolls-Royce is like nothing you’ve ever felt. Even though the Ghost weighs almost 5,500 pounds, you won’t notice as long as you keep it up to date on services and maintenance. To move the Ghost’s 5,500 pounds of sheer luxury auto brilliance requires some serious power under the hood. The Ghost has 6.6 liter, V12 twin turbo engine that goes from 0-60 in under 5 seconds. The limiter on most Ghost vehicles makes the top speed 155 mph on the vehicle. Along with its mini luxury yacht on wheels size most certainly does not come great fuel economy. When you’re powering that weight of a vehicle, you shouldn’t expect to get anything better than 20 miles to a gallon of gasoline. If you’re looking for a vehicle that gets good gas mileage, the Rolls-Royce Ghost certainly is not for you. The way that the Ghost and its similar models tend to feel when it comes to smooth handling and riding experience is a testament to its impeccable manufacturer designed comfort suspension. The Rolls brand achieves this smooth driving experience with an independent front double wishbone, a multi-link suspension and two anti-roll bars at the front and back of the car. The V12 engine gives the vehicle a good amount of “get up and go” and you will not mistake the audible roar that luxury vehicles of its caliber usually have. While many newer luxury vehicles feature some form of bright, potentially distracting infotainment system, the Ghost and its sibling vehicles keep it classy yet simple with a traditional speedometer and gauges. The interior of the Ghost is decked out in some of the finest piano woodgrain finish that you’ll ever see. The backseat of the Ghost comes with the option for two TV screens and also features a stow-away tray. If you can even opt for soothing massage seats if you so desire. As you move forward with your decision to purchase a Rolls-Royce Ghost, you’ll need a highly skilled mechanic to perform the necessary maintenance tasks on it, to keep your investment running smoothly. At Otto’s European, we a Rolls-Royce certified, giving us exclusive access to parts that other shops might not have, and we also have two decades of experience working on all European luxury vehicles. If you have any questions, or to book an appointment, don’t hesitate to give us a call today.